Is it safe for your dog to eat Watermelon? Read more to find out. It’s summer. It’s hot. There is nothing quite as thirst quenching as ice-cold watermelon. Watermelon may be a healthy snack for people, but is it a good choice for dogs? According to the ASPCA, feeding watermelon to dogs is not toxic. It should be noted however, that the seeds and rind could cause intestinal irritation. Watermelon is approximately 71% water. It is a source of vitamin C, potassium and magnesium. It is also considered an antioxidant. 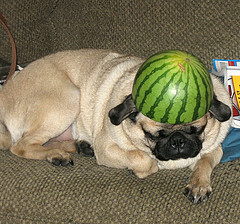 Most fruits are healthy sources of nutrition for dogs, and watermelon can be a part of a healthy canine diet. Remove the seeds and rind before feeding watermelon to a dog. This will prevent possible stomach upsets. Start slowly by feeding your dog small portions whenever you add a new food to a dog’s diet. Check with your veterinarian for health and nutritional information. Veterinarians can assist owners with individual health issues such as allergies and food toxins. Although watermelon and most fruits are good for dogs, be aware that grapes, onions and other seemingly healthy foods can be poisonous. Enjoy the summer sunshine by sharing a watermelon snack with your furry canine companion. What do other dog owners have to say about whether their dogs can eat Watermelon or not? See comments below. Know if dogs can or can't eat Watermelon? Help other dog owners by leaving a comment.